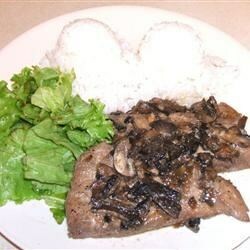 Very good and easy mahi mahi filets steamed over yellow onions, button mushrooms and garlic. In a large skillet, heat olive oil and cook onions, mushrooms and garlic over medium heat until onions are transparent. Cut the mahi mahi into 3 inch long filets. 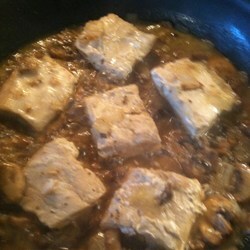 Place the Mahi Mahi fillets over the onions, mushrooms and garlic. Salt and Pepper the first side of the filets to taste. Add white cooking wine and lemon juice. Cover and cook 4 to 5 minutes. Turn the filets over and salt and pepper the second side to taste. Cook 4 to 5 minutes or until fish flakes easily. Remove only the fish to a heated plate and keep warm until sauce is ready. In the same skillet with all the onions, mushrooms, garlic and cooking wine, raise heat to medium/high. Bring to a boil. Dissolve cornstarch in the 2 tablespoons of water; stir into skillet. Stir the sauce continuously until sauce thickens to desired consistency. Pour sauce over mahi mahi filets. Serve immediately.